He described Independent Media’s newspapers as the most credible and objective in the country and said its titles repeatedly resisted pressure to take political sides. This related to Iqbal Survé’s under-oath evidence the previous day when he had been questioned about the autonomy of the editors of his newspapers during the proceedings of the Mpati commission of inquiry into the Public Investment Corporation (PIC). My subjective perception is that there is overwhelming factual evidence – which is a matter of repeated public record – to prove that he perjured himself in this regard. In this regard I ask the commission, in particular, to take into account the extract below from a Daily Maverick article by Ferial Hafajee who provides, I believe, compelling proof that Survé communicates his diktats to the people who are vulnerable because they are dependent on him for an income, through his CEO, Howard Plaatjies. The Star’s editor, Japhet Ncube, did not want to comment. The rest did not respond to detailed requests for comment on how they chose their lead articles; on whether they believed that Bezos’s hands-off approach to editorial freedom is the right one, or whether they prefer an activist and omnipresent owner like Survé, and on whether they believe they enjoy editorial autonomy. While the editors did not respond, former staff shed some light. They said Survé sent diktats to editors about the kind of personalised blanket coverage readers and audiences witnessed on Monday through his executive henchman, Howard Plaatjies, who is the chief operating officer. “It comes with a note saying ‘Run on Page 1’,” revealed a staff member who did not want to be named. Plaatjies did not respond to requests for comment, although his WhatsApp revealed the messages had been read. Fantasy Man. More of Zapiro’s magic available at www.zapiro.com. 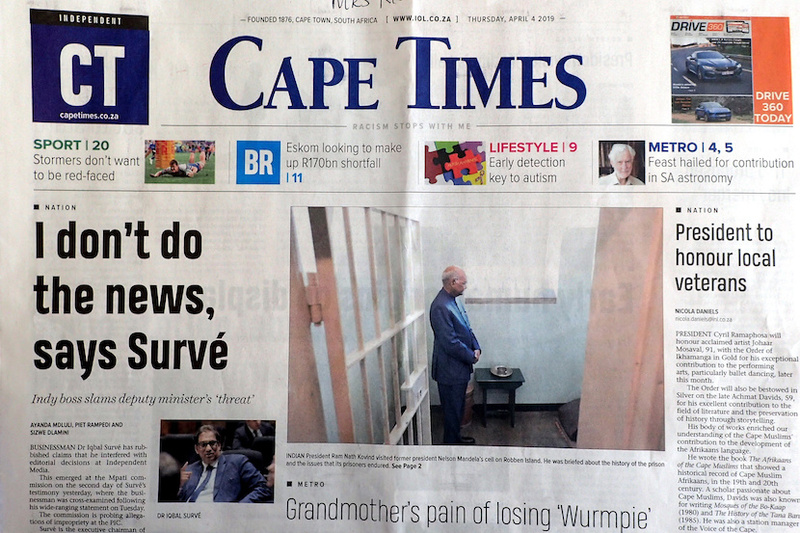 Survé’s editors are only too aware of the punitive consequences should they not heed these commands – particularly those which demanded of them that they publish appalling and synchronised attacks on their fellow journalists – one of the worst examples of gutter journalism this country has ever experienced. These attacks sometimes appear under the disguised-provenance by-line of ‘Staff Writers’ and are assumed to have been written by Survé himself. One example of the punishment Survé metes out to people on his payroll that he considers recalcitrant was the dismissal of the Sunday Independent editor, Wally Mbhele. This, after the ANC complained about a well-researched and factual article published in the Sunday Independent that showed how it had gerrymandered its own policies to make the ethically-compromised Brian Molefe a member of parliament. The SA Press Council dismissed Survé’s complaint in this regard. A more recent example was the termination of a weekly column by Al Jazeera reporter Azad Essa after Survé’s Chinese financiers communicated their displeasure about an Essa article on the persecution of more than a million Uighur Muslims in China’s Xinjiang province. Survé sent a very clear message to his editors prior to the Nasrec ANC elective conference and that message was that he had thrown his weight behind the presidential campaign of Nkosazana Dlamini-Zuma , in substantial measure because she shares his views. Then, according to an unchallenged allegation by Dougie Oakes, the former political editor of the Cape Times, Survé ordered all his editors to attend a meeting with her – just in case they didn’t get the hint. So much for the editorial autonomy about which Survé testified under oath at the Mpati commission. In the first few weeks in my new position, Survé called me virtually every day with “suggestions” of who to interview: Brian Molefe, Kebby Maphatsoe and Carl Niehaus were among the political glitterati he thought should appear in Indy newspapers. With most of the people he suggested being soaked in scandal, I said: “Thanks, I’ll think about it,” and never did. What then, is one to make of the following claim by Survé, quoted in the above-mentioned Cape Times front page article? ‘People want me to take sides, they want Independent Media to take sides and I make the point repeatedly that I don’t do the news. The day we no longer have objectivity, the business is gone’, he said of his technically insolvent media company which, since the Sekunjalo takeover, has lost the majority of its most accomplished staff. Independent Media now owes the state-run asset manager an outstanding balance of about R1.5bn, given the interest that has accrued on the initial investment. Furthermore, according to Magda Wierzyca, the Ayo shares for which the PIC paid R43, are now worth 52 cents. Might you not be forgiven for concluding that the Sekunjalo Independent Media is already ‘gone’? 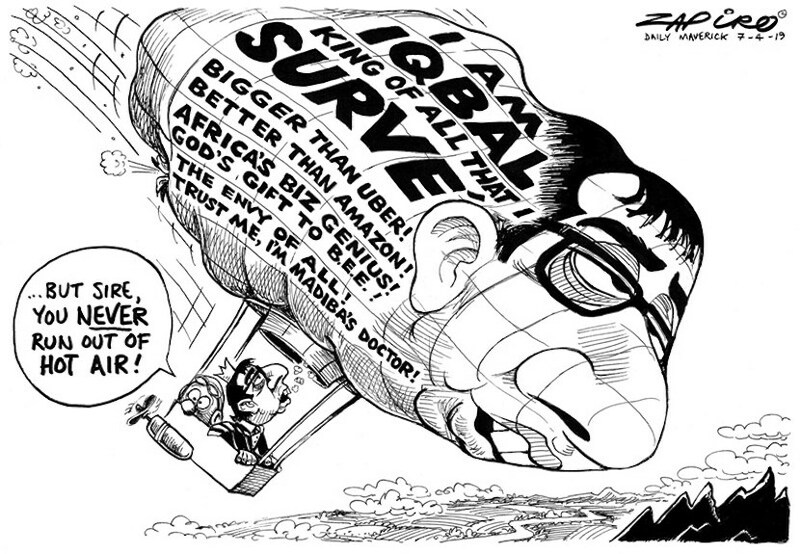 From the beginning of the PIC-funded Sekunjalo takeover of the former Argus Group newspapers, Iqbal Survé made it clear that anyone who crossed him, or did not toe his dictatorial line, would have their careers terminated or would be persecuted. Fantasy Man’s ego, as Mondli Makhanya and Ivo Vegter and Twitter point out, is paramount. As Donwald Pressly, one of the country’s most experienced reporters observed, his investigation into the Sekunjalo tender to take over maintenance of our coastal patrol and research vessels led to him being attacked even before Survé took over. He was dismissed shortly thereafter as was Cape Times editor Alide Dasnois because she allowed an article to be printed on this eminently-newsworthy matter which formed the basis of Thuli Madonsela’s ‘Docked Vessels’ report. The author of the article, Melanie Gosling – an esteemed environmental reporter who asked for early retirement two years later after suffering relentless persecution – received a threatening letter from Survé’s lawyers, something without precedent in South African media history. Survé’s minions, Karima Brown and Vukani Mde (who have since left his employ) wrote an article in which white staff were overtly threatened, an article in which they made the self-evident point – that the new company owner, like themselves, ‘wears his ANC heart on his sleeve’. Survé then wrote a letter to staff in which he guaranteed editorial independence – a promise which had as little veracity as did his recent testimony on this subject at the Mpati commission. “This means no journalist has to fear when writing a story if one or more of the companies in Sekunjalo Group is involved. I do not expect special favours or puff pieces to be written by any journalists. All our stories must adhere to the highest standards required. “This means they have to be balanced, fair and accurate. What they can’t be is one sided, inaccurate and prejudicial. I have always valued the principles of transparency, fairness and independence. More importantly, in our quest for fairness, we should give everyone an opportunity of the right of reply. “As executive chair, I will uphold these values and expect all of our journalists and editors to do the same regardless of which story it is they cover. Thereafter, his editors were forced to promote him and his business interests by publishing one hagiographic puff piece after another after another after another after another after another after another after another after another, the most recent having a nauseatingly obsequious headline. They resigned, in unprecedented numbers thereafter. The ethical journalism which in that letter Survé claimed to champion, quickly proved to be non-existent, most specifically at the Cape Times. The real truth is contained in the undisputed Dougie Oakes article headlined It’s time to go, Iqbal Survé and the uncontested Daily Maverick article by Ferial Haffajee. My request is that the evidence leader at the Mpati commission, advocate Jannie Lubbe, make those articles part of the record in the context of Survé’s manifestly-false and under-oath claim about the autonomy of his editors. Hopefully, in this context, commission chairperson Judge Lex Mpati and his assistants Gill Marcus and Emmanuel Lediga will also take cognisance of the never-ending exodus of editors from Independent Media – no less than three within the space of a few weeks last year – and ask why this is happening. There are 1.2m civil servants and 360,000 pensioners who are dependent on the Government Employees Pension Fund for their present and future quality of life. That’s a lot of votes, Mr President. They will have noted the saturation coverage given in the Indy newspapers to Iqbal Survé around at parliament, photo-bombing ANC but not opposition MP’s while punting his Survé philanthropies and living in the cloistered luxury of his R140m, high-security Silo District apartments – talkng all the while about his ‘simple life’. They will also have noted that this philanthropy does not extend to them and that this information has been withheld from the readers of the Indy newspapers and the IOL website. They will, furthermore, have noted that there has been no refutation of the allegation by Dougie Oakes that Iqbal Survé’s ‘philanthropy’ also does not extend to the Indy interns who, Oakes avers, are paid a pittance and sometimes not paid for months on end. When James Myburgh of Politicsweb revealed three years ago that Survé was making no effort to repay the R1bn PIC loan, this was attributed by Survé to ‘racism’. When the PIC would not grant the Sagarmatha loan, this was attributed by Survé to ‘racism’. When the highly-suspect Sekunjalo/DAFF tender to maintain the ships that protect our marine resources was withdrawn, he blamed the media. When his attempt to list Sagarmatha on the JSE failed, this was blamed on ‘smear campaigns’ – not that he had failed to comply with the regulations. The GEPF members will have listened to his testimony and taken note of his divisive ethnic antipathies – antipathies which are routinely reflected in his newspapers. They will have noted that, while the PIC is becoming ever-more threatened, there are some who are growing wealthy at their expense – this to the detriment of media freedom in this country and our international reputation. They will be hoping, Mr President, for an outcome in keeping with your recent promises. Ed Herbst is a veteran journalist who these days writes in his own capacity.